Back to drawing practice, friends. I’m using still life drawings to practice my skill with and there are no shortage of subjects. Here’s one sketch I did of a strawberry. I’ll have more up in the coming weeks, so stay tuned. Today, rather than talk about my drawings, I’ll talk a bit about the work of someone else for a change. That person is Willem Claeszoon Heda. What was that? You’ve never heard of him. Compared to many other famous artists out there like Leonardo Da Vinci and Rembrandt, he’s not one of the better known artists. 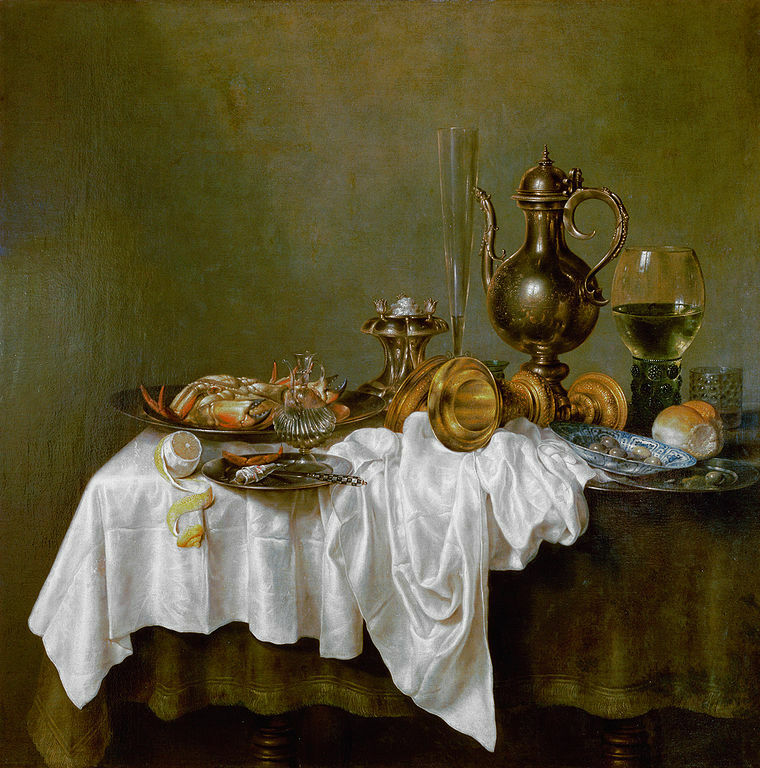 Willem Claeszoon Heda (1594-1680) was a Dutch artist who was best known for working exclusively in still life. You can read more about him on Wikipedia. His still life paintings are a sight to behold. If you’re into still life, Heda’s pieces are definitely worth studying. He uses a wide range of ellipses in his work and check out that table cloth. It looks quite realistic. This is a good example to study of how to render cloth folds. Here’s another of my gouache paintings. It’s amazing that I could get a number of different shades of blue by diluting the paint with opaque white. Personally, I find this gouache painting one of my better still life works. I have another painting for this week’s post. This is one of my better gouache paintings from my summer class. This works well. I use abstraction here to define the shapes and the complements of purple and yellow work well to give a very pleasing visual.